bourgogne | Joy. Journey. Jotter. 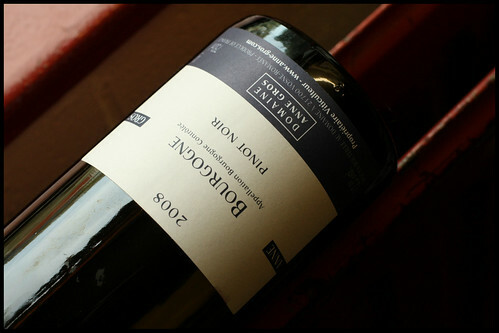 Domaine Anne Gros Bourgogne 2008, a photo by mengteck on Flickr. Deep ruby red hues revealed notes of cloves, pronounced butterscotch, and warm popcorn with butter aroma which seemed to overwhelm the primary fruit profile at this juncture*. Tart red fruits and wood characters on the palate with a nice (but not overly strong) tannic grip and good acidity. Med to med- finish. A little rough on the edges for me. Not sure if time will bring all the elements together but we shall see. *Tried the last glass after just 12 hours and guess what? All the Pinot Noir varietal characters came rushing to the fore and those malo-effects seemed to have taken a backseat. Yums! 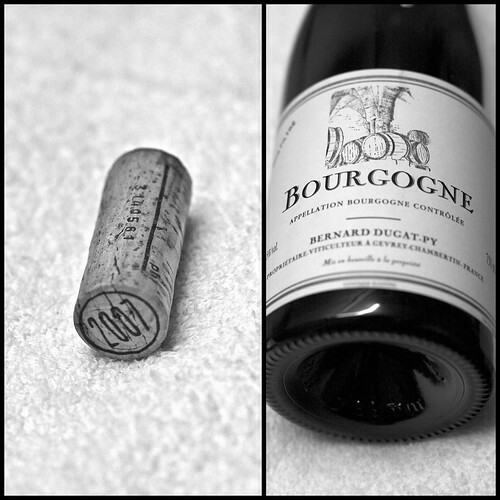 2007 Bernard Dugat-Py Bourgogne, a photo by mengteck on Flickr. Amazing, amazing bottle. I liked how the cork closure had a serial number stamped on it – will definitely make troubleshooting corked wines easier (should it materialize). This kinda reminded me of Leroy’s 2000 Bourgogne. I was taken aback by how feminine and perfumed the wine was initially, but you know what? 24 hours later, it turned into a beefy, muscular, and powerful beast, characteristic of the region, or terroir if you like, where it was made. If only every bottle of Bourgogne can be like this…. I wasn’t planning on drinking two bottles of burgundies for dinner a few days ago but these were just so drinkable and yummy that my dinner companion and I finished every single drop with the roast chicken, and baby spinach & tomatoes salad! 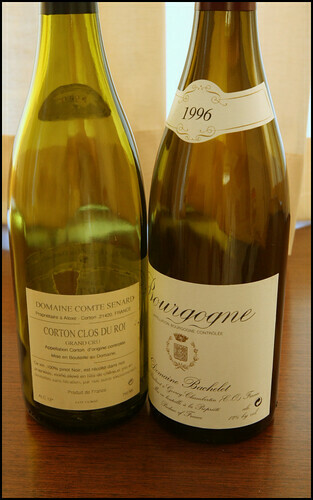 The bourgogne from Domaine Bachelet was a little more tart and acidic than the Corton Grand Cru but both were equally youthful, perfumed with ripe cherries & red fruits, and well balanced on the palate.